Pizza and Policy Forum: Why Is Denuclearization of North Korea So Elusive? 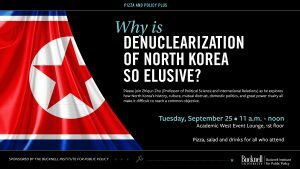 We encourage you to join us on Tuesday, September 25th, 11:00am – 12:00pm in the Academic West Event Lounge on the 1st floor for a Pizza and Policy Forum on why the denuclearization of North Korea is so elusive. Professor of Political Science and International Relations, Zhiqun Zhu, will discuss how culture, mutual distrust, domestic politics, and great power rivalry all make it difficult to reach the common objective. Comments Off on Pizza and Policy Forum: Why Is Denuclearization of North Korea So Elusive?